IPL 2019: Two big points for Mumbai as Chennai lose their first match. Suryakumar and the bowlers were phenomenal to outclass Mumbai. 00:00 IST: WICKET, off the last over, another wicket falls, it has been a day that may do more good for CSK than bad. They must have learned their lessons. They will realise they conceded too much in the last five overs. 23:54 IST: FOUR, Chahar gets going from word go, but it seems too little too late. Chennai needs 49 runs in 12 balls. CSK: 122/7 in 19 overs. 23:50 IST: OUT, Kedar is gone and it seems all over for the defending champions. Seems like Pandya-Pollard’s cameo at the end has made all the difference. Four catches for Quinton de Kock. Chennai needs 56 runs in 12 balls. CSK: 115/7 in 18 overs. 23:42 IST: Bumrah is bowling superbly well this over, he has not allowed the batsmen to get after him. Only three from the over. Chennai needs 63 runs in 18 balls. CSK: 108/5 in 17 overs. Looks impossible, but this is IPL and only a fool can predict. 23:35 IST: 11 of the over, Kedar fights on to keep CSK hopes floating. Chennai needs 66 runs in 24 balls. CSK: 105/5 in 16 overs. 23:04 IST: The duo have taken India over the line recently against Australia, can they do it again with the yellow jersey? CSK: 66/3 in 10 overs. 22:58 IST: Kedar’s counter-attack has helped CSK recover from an early collapse, but now he needs to continue and just not throw it away. CSK: 63/3 in 9 overs. 22:40 IST: FOUR, good shot from Kedar. He pulled a short ball for a much-needed boundary. Crafty indeed, back to back fours for Kedar, three in the over. Just what the doctor ordered for CSK. CSK: 49/3 in 7 overs. 22:36 IST: Dhoni comes into bat with a mountain to climb. The veteran is looking to get a feel of the pitch and seems like there is some extra bounce. One from the over. CSK: 34/3 in 6 overs. 22:30 IST: OUT, Big fish Raina is gone. This is a big blow, but spare a thought for the breathtaking catch by Pollard. CSK: 33/3 in 5 overs. 22:25 IST: SIX, Jadhav gets his innings underway, just flicks it into the stands. 11 from the over. CSK: 25/2 in 4 overs. 22:20 IST: MI in the driver’s seat, can the champions find a way to win? SIX, Vintage Raina launches a counter-attack. CSK: 15/2 in 2 overs. 22:15 IST: Malinga from the other end. FOUR of a free-hit. CSK will look to settle down in the chase. OUT, they are crumbling. Watson perishes. CSK: 6/2 in 2 overs. 22:10 IST: Behrendorff makes his IPL debut and has started proceedings for MI. This is not an easy chase hence the start is important. OUT, Golden Duck for Ambati Rayudu. CSK: 1/1 in 0.4 overs. 21:50 IST: Can CSK close out well? Bravo has the ball. HUMUNGOUS, no prizes for guessing, Pollard it is. Helicopter shot from Hardik for SIX. And then FOUR. Power-hitting at its best. 29 off the last over. MI: 170/5 in 20 overs. Bravo has picked up 100 IPL wickets. 21:40 IST: SIX, that is the biggest of the night by far and it is Hardik Pandya. They would look to make the over big. Big SIX for Pollard. 16 from the over. MI: 140/5 in 19 overs. 21:25 IST: Krunal Pandya OUT for a well-made 42 off 32 balls. SIX Surya is turning it on. 21:20 IST: Bravo will now bowl till the end as has three overs left. FOUR, Surya shows finesse to pick up an important boundary. 50 partnership up as MI breach the 100-run-mark. MI: 103/3 in 16 overs. 21:15 IST: Mumbai will hope Surya and Krunal get on a roll. Tahir is on. SIX Hefty blow from Tahir, he has pulled the trigger it seems. 11 of the over. MI: 93/3 in 15 overs. 21:04 IST: Bravo brought into the attack. Bravo is cleverly taking the pace of the ball and it is coming off well. DROPPED, Krunal gets a lifeline, Mohit drops a dolly. MI: 78/3 in 13 overs. 21:00 IST: Mumbai would be looking at anything between 150-160. FOUR, Krunal gets his first boundary, it was aerial. Productive over for MI. MI: 74/3 in 12 overs. 20:55 IST: FOUR, Surya uses the pace of Tahir and sweeps him. Surya needs to be there if MI want a decent total. MI: 64/3 in 11 overs. 20:50 IST: Krunal gets cheeky, picks a FOUR of a reverse-guide. MI: 57/3 in 10 overs. 20:40 IST: Tahir gets Yuvi, OUTTT and look at him go for a lap around Wankhede. He is 40 and he surely is giving the younger generation a run for their money. Rayudu takes a clean catch inches from the rope. Krunal joins Surya, looks like MI want to keep the left-right combo going. Two from the over. MI: 50/3 in 9 overs. 20:37 IST: Jadeja comes into the attack, removes MI captain Rohit of the very first ball. 20:37 IST: Tahir into the attack and he has hit the perfect line right away. Five of the over. MI: 45/1 in 7 overs. 20:34 IST: First bowling change, Mohit Sharma brought in place of Shardul Thakur. And it is working, just one off the over. The powerplay is over. MI: 40/1 in 6 overs. 20:26 IST: Dhoni gets defensive after CSK go for runs. A flurry of boundaries for Yadav as he is dealing in boundaries. Three boundaries on the trot. He looks in ominous touch. MI: 38/1 in 5 overs. 20:19 IST: Suryakumar walks into the middle and creams one for FOUR on the up. He looks like the player in form. One more, this time he picks a bad ball on his legs for FOUR. This time it is Rohit who joins the party and picks up his first boundary. Just the over MI were looking for after the wicket. 16 from the over. MI: 25/1 in 4 overs. 20:14 IST: The CSK opening bowlers are not looking to experiment, they are focussed on maintaining a good line and it is paying off. STREAKY, first FOURRR. De Kock runs out of patience, MI lose the opener. MI: 8/1 in 2.3 overs. 20:08 IST: Thakur will share the new ball duty with Chahar. Thakur is getting the ball to move. One off the over, what a start by Thakur. MI: 3/0 in 2 overs. 20:00 IST: Deepak Chahar gets proceedings underway. Quinton de Kock, Rohit Sharma open for Mumbai Indians. Chahar starts with four dot balls. Two runs off the first over. MI: 2/0 in 1 over. 19.57 IST: Players from both the teams take the field, Rohit Sharma and Quinton de Kock will start the proceedings for Mumbai. Pacer Deepak Chahar has the ball in hand, he will start the proceedings for Chennai. 19.45 IST: Rohit Sharma says, “It’s an important game for us. Two losses in three games doesn’t justify. I thought we played some good cricket, but couldn’t capitalize on the crucial moments. We would’ve chased first. It’s a blessing in disguise to bat. But it looks like a good wicket to bat. In all three games, we have got 170-plus with the bat. So, If we bat to our potential, we will get to a good score and that is the idea. Let’s post a good score and have something for the bowlers. We have got two changes. Mitchell McClenaghan misses out and Jason Behrendorff makes his debut for us. Mayank Markande is not well and Rahul Chahar makes his debut too. He has been a great asset for us, didn’t play last year but a very exciting talent, very energetic on the field and can bat a bit as well. Hopefully, all of us together can deliver today”. 19.41 IST: The WAG’s here..
19.31 IST: TOSS – MS Dhoni wins toss as Chennai Super Kings opt to bowl vs Mumbai Indians at Wankhede Stadium. 19.25 IST: PITCH REPORT — “It’s not a turner. This will suit MI. This is an outstanding cricket wicket. The extra bounce is really going to help the batsmen. Dew is likely to come in later,” says Sanjay Manjrekar and Brendon Mccullum in the pitch report. 19.07 IST: Mumbai holds a 14-12 head-to-head advantage over CSK, including one win in the defunct Champions T20 League. 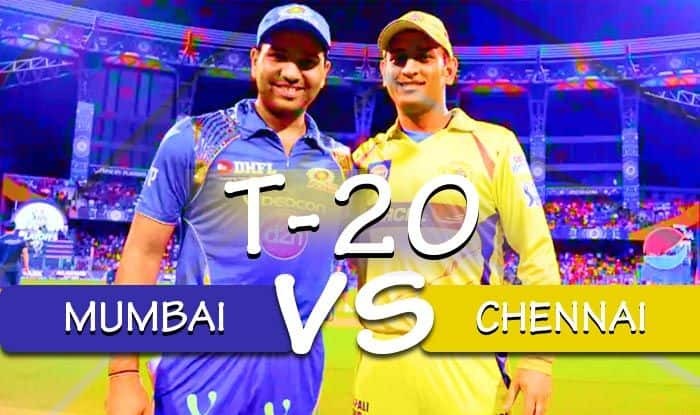 19.00 IST: Hello and a very warm welcome to our live cricket blog of match 15 between Mumbai Indians and Chennai Super Kings from Wankhede Stadium, Mumbai. Brief Preview: With skipper Mahendra Singh Dhoni in red-hot form, Chennai Super Kings will start favourites against the slightly off-colour Mumbai Indians when the IPL’s two most successful teams have their first showdown of the season on Wednesday. The Super Kings, three-time winners of the T20 League like the hosts, have been on a roll with three wins on the trot that have boosted them to the top of the table.